This is a dark brown ale with a coffee aroma. It is a dry porter ale, with a black coffee taste and a hint of smokiness and blackcurrent. This ale lacks the warming winter fruit taste of stronger porters, which makes it more drinkable as a session beer for the darker ale drinker. This is produced as a live ale, so needs to be cooled and poured carefully to avoid the sediment. Madrigal Craft Brewery is a new brewer based in the old coach house of Lynmouth Manor, Lynmouth North Devon. The brewery is a small batch artisan brewer producing a range of ales. Their beers are not fined, relying on natural deposition of the yeast fines. Morland was originally brewed in Oxfordshire before being taken over by Green King. The beers are brewed under the Morland name by Greene King in Bury St Edmunds. 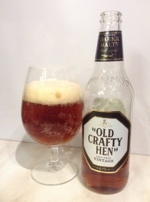 This is a rich malty English Strong Ale variant of the famous Old Speckled Hen. It is a blended ale with a base ale using crystal malt to give the toffee taste and Challenger, First Gold and Goldings hops. It is blended with a 12% strong ale to give a beer in the style of Suffolk Old Ale. This ale is a dark Ruby colour with burnt oak and pest aromas. It has a sweet taste running rapidly into a dry peat and smoke aged oak taste. It leads one to think of being in an old Tudor house, with the smell of the smoked wood beams and dark oak furniture. This ale is a collaboration between the Williams Brothers Brewery in Scotland and the New York based Brooklyn Brewery. Made with pested malt, Scottish honey, Treacle and Brooklyn yeast. An ale somewhere between a porter and a stout. This ale is a darker chestnut ale with a plum fruit and malt aroma. The taste hints of sweet plum and chocolate bitter. A good winter ale with tastes of dark heavy fruits and chocolate. Moorhouse’s Brewery was established in 1865 in Burnley, Lancashire. This ale is not listed in their range, which is quite extensive. Being not too far from Pendle most of their brews have names alluding to the ‘Pendle Witches’. This is a chestnut coloured ale, with a good fruity aroma. It has a good sweet taste and fruit notes, for brown ale. This ale is a very pleasant brew, produced in memory of the Scottish Poet Robert (Robbie) Burns and to celebrate Burn’s Night. This ale would go well with hagis. Belhaven Brewery is in Dunbar and has been brewing for 300 years. This is a golden ale with malty aromas. The taste has malt and sweet orange notes, and a following hop bitterness. A rather light coloured ale for a typical Christmas beer but had orange warmth. Overall it tastes like a darker ale. This brewery is based in Warrington, Cheshire. This is the Christmas seasonal offering from the brewery based within The Brew House in Bath. It is a dark red ale with a spicy aroma. The taste is a slightly sharp start, with a full Christmas spicy and fruity follow-on. A porter style and a good Christmas, seasonal ale. This ale is bright amber coloured with a pleasant toffee malt aroma, with aged oak wood notes. The taste is made up of sweet smooth, honey caramel toffee and vanilla notes, with an aftertaste of aged oak. A good strong ale, with an aroma reminiscent of sitting in an Elizabethan or Jacobean house surrounded by aged oak furniture. A strong ale for all seasons but especially winter. This was the first beer produced in 2003 from this Edingburgh based, Scottish brewery, produced by storing in oak whiskey casks to flavour before using for whisky. Well worth trying if you like strong ales. This is a Swedish dark red ale with a strong dried fruitcake aroma, which would be expected of English porter ales. It has a good heavy dried fruit or prune and malt taste, with the lighter bitterness of a lager. This ale is produced by the lager method of bottom fermentation followed by cooling, normally down to about 4°C. This is a dark ale with a sweet plum aroma. The taste is bitter sweet, moving to a bitter chocolate finish. 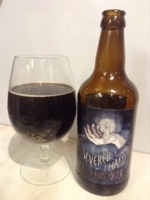 This beer is a porter style dark ale from this Essex based brewery. The Ale is named after the head brewer’s dog and has twice won the CAMRA Winter Beer of Britain.